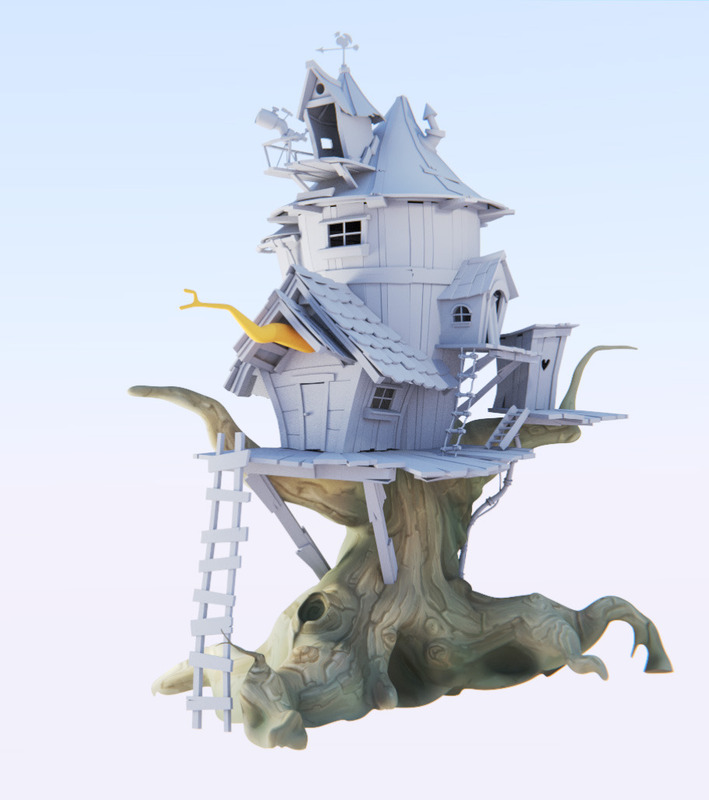 I am currently a student at the Animation Workshop in Denmark, and this tree house was made as a self study at school. I wanted to try to get more comfortable making environment projects. I have a “thing” for adorable tree-houses, and this is a really nice one! “Plugged!” Plus, your short ‘making-of’ movie is terrific. This is fantastic Kjartan. Capturing something that stylized in 3D, that ain’t easy. Capturing something that stylized in 3D, that ain’t easy. I actually thought it was a 2D painting until I watched the movie, and then I thought it would be 2D multi-planing or camera mapping. Really nice work. My only issue (if you could call it that) is that the water doesn’t read well. It almost looks more like a road. Perhaps an old row-boat on the shore would be a good addition, if you are still working on it. Also, the stream wouldn’t have grass growing right down to the waterline. Any stream will have at least a very narrow bank where the water has risen and fallen, even if only slightly. I think this is what’s giving it the road-like appearance. But those are minor things, really. When can I move in? Did you do anything special with the shaders as well or is the look mainly achieved by very nicely handed painted textures? It’s nothing special really. I just spent a lot of time sculpting and painting it all by hand. The only real trick is to keep the shaders and lights relatively diffuse and flat. You can see how it works pretty clearly in this early render. thanks! I’m doing most of my texture painting in 3dCoat nowadays, though I did paint some of the smaller things in Blender (it’s starting to become a pretty good texture painting tool too). :keenly: Very nice work, Love tree houses. I actually thought it was a 2D painting until I watched the movie, and then I thought it would be 2D multi-planing or camera mapping. That was my thought. Once it started moving I was like :drool:. Once again - awesomeness! Congrats on the plug! Storytelling image, I can almost feel it.